I'm currently stuck on 495s in MA and couldn't be happier. I got out of work early, I've got decent scenery, my rdio jazz playlist going , smoking some fine tobacco from my pipe and looking forward to my adventure home. I love these kind of days and don't see why more people don't relish in the adventure of it. I guess that could either be a testament to either my out look or I just live a really boring life! 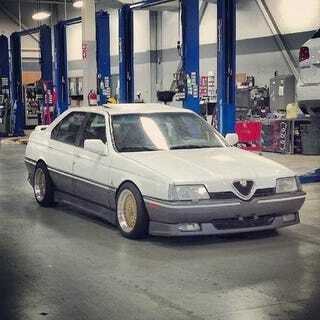 The alfa pictured I'm thinking of buying, $2k, southern car and lowish miles.